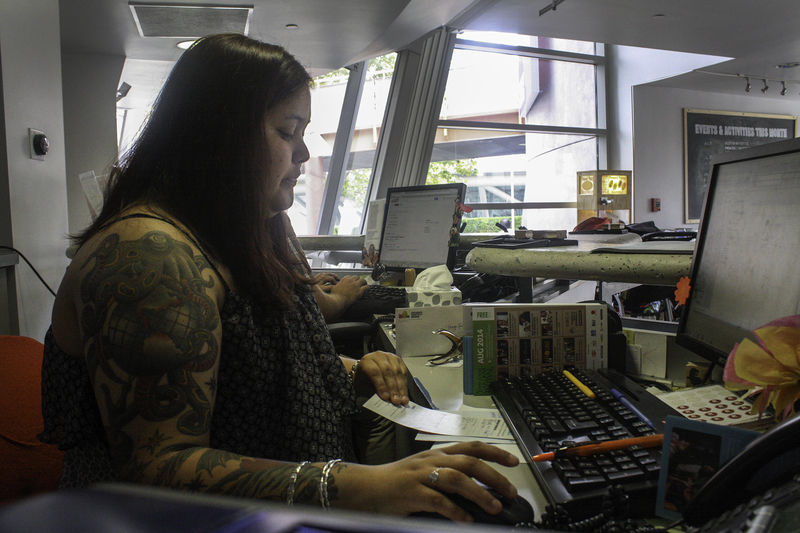 Renae Benavente works her full-time job at the Children’s Creativity Museum in San Francisco on July 23 2014. Photo by Marlene Sanchez/Bay News Rising. While advocates cheer a rise in San Francisco’s minimum wage rising to $15 an hour, the tough truth of the cost of living here, told firsthand, changes the citywide conversation. Renae Benavente, 27, illustrates the reality, working three jobs sprawled across seven days a week. Like most college graduates, she faces the stress of paying off student loans and finding a job simultaneously. She juggles a full-time job at the Children’s Creativity Museum and two part-time jobs, one at Goldenvoice, a music entertainment company, and another at Noe Valley Bakery. “I don’t really have a choice,” she said. According to a report from the National Low Income Housing Coalition, a minimum wage worker in the Golden State would need to log 130 hours a week to rent a market-rate, two-bedroom home. That would leave 38 hours to eat, sleep, shop, cook, and lead a personal life. San Francisco is a little above the curve with a minimum wage of $10.74 an hour, compared to the state’s $9 an hour. But, according to the same report, a person must earn nearly $30 an hour to afford a one-bedroom home in San Francisco. With hardships like these, San Franciscans are forced to make sacrifices. Renae Benavente considers herself “lucky.” She pays $510 a month for her own room in a house in Ingleside. She lives with two roommates. Besides her rent, Benavente pays about $1,200 in bills each month. This includes credit card, car insurance, phone and tax bills. She pays her taxes through a monthly payment plan since she can’t afford to pay it in full. Maintaining a social life can be a tricky proposition given her schedule. On late nights, she works the ticket booth at the Regency Ballroom, sometimes as late as 2 a.m. On Mondays and Tuesdays, she has to be up by 5 a.m. for the morning rush at her bakery job. This entry was posted on August 13, 2014 by skettios99.